To borrow Dobzhansky’s famous line, nothing in fisheries makes sense except in light of menhaden. So where did all the menhaden go? In 1880, George Brown Goode released his monumental work, “A History of the Menhaden.” This was the first, and still one of the the most comprehensive, studies of a fishery to date. Goode’s work laid the foundation for fisheries ecology, and the breadth of his study remains unmatched. Goode went out with fisherman to observe catches, took detailed measurements of menhaden landings over nearly a decade, interviewed fishermen, consumers, coastal residents, even lighthouse keepers to find out where menhaden schools were and how they were changing. 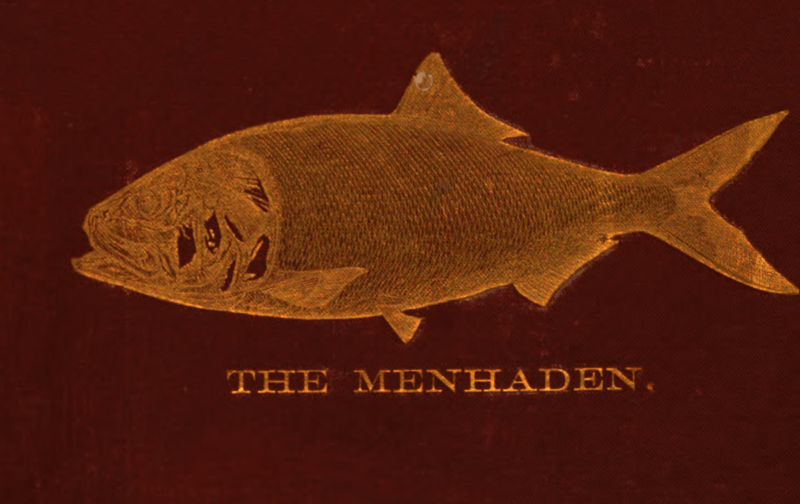 In 1879, after the publication of his original book, but before significant revisions were made for the 1880 edition, the menhaden schools had vanished north of Cape Cod and catches throughout the east coast were plummeting. G. Brown Goode had begun his menhaden study at the beginning of the fisheries failure. Before the advent of industrial fishing, when most ships were powered by oar or sail and nets were hauled by hand, before the idea that fisheries could even be managed, before anyone knew that the sea had limits and for the first time recorded in history, the greatest fishery in the world was on the verge of collapse. You could be forgiven if you’ve never heard of a Menhaden. Menhaden go by many names: mossbunker, bug fish, fat-back, whitefish, porgy, old-wife, chebog, greentail. In order to study a fishery as broad as menhaden, Goode determined the common names used in every region menhaden were fished. It may seem like a minor point, but how could you even hope to study a fishery if you don’t know what the fisherman call their catch? Goode provided the definitive biological description of the genus commonly referred to as menhaden: Brevoortia. His study of external and internal anatomy, growth rates and feeding habits, and geographic ranges could have stood on their own, but they real beauty of this document is the synthesis of biology, natural history, ecology, and human interactions. The investigation of the fishery included both qualitative and quantitative data, from extensive quotes to fish measurements. Since Goode’s time there has been a division of disciplines and loss of such a comprehensive study methodology to really address all sides of an environmental problem. Such disciplinary boundaries are obscuring the causes and potential solutions to environmental crises. Goode was not only in the field measuring the return of menhaden in the spring but asked fishers and processors about timing and trends over their career. One respondent described, “another run began about the first week of November, and quite a large additional quantity of fish were taken. They seemed to ‘bunch up’ well but were poorer in oil than previously thought, so that the fall fishing, in the point of oil, was a failure”. Goode could have easily made a career out of describing only part of what he covered in the book. He is among a handful of scientists to answer basic questions with divergent methodologies. He interviewed fishers on what they observed the menhaden eating and performed a stomach content analysis to verify what he had learned through the interviews. Combining techniques is still considered groundbreaking today. By collecting and publishing different types of data, Goode also lends legitimacy to different sources of data. His comprehensive sampling gave credit to the ecological understanding that fishermen had from spending a career on the water. The compelling quotes he included in his book largely agreed with the biophysical data he collected himself and lent some degree of explanation as to the observed trends. No source of data was left unturned, making it unlikely that he left out some important dynamic affecting the health of the fishery and dependent fishing communities. The fishermen talk not only about abundance of the menhaden but how much oil per fish could be manufactured. Both factors are therefore important in understanding fishing pressure on the stock. Both are also important to consider when people discuss the collapse of the fishery – it’s not only in quantity but in quality. I hope that’s true- later this afternoon I’m taking samples from some menhaden for stable isotope analysis. I suspect that they form an important part of the diet of young-of-the-year sandbar sharks here in South Carolina. Should have a pretty clear signal, they’re basically sacks of oil. Makes you wonder if declining sandbar populations are due to their food source being removed from the ocean though. I’ve been finding a ton of menhaden in my spiny dogfish stomach contents. Maybe they’re competing with juvenile sandbars? If dogfish and sandbars are using the same food resource, that’s probably nothing new. Are adult spiny dogs in estuaries or offshore? Usually they occur in big schools between the shoreline and the edge of the continental shelf, with the largest ones hanging out closer to shore. They’ll follow food all the way up to the beach, and occasionally wander into bays and estuaries (as fishermen in the Beaufort/Morehead City area are discovering right now). The conventional wisdom is that they migrate off of the Carolinas during the winter and start heading back to New England in March and April. The fact that apparently there’s a large number of them in Bogue Sound right now is breaking a lot of rules. can you help me out with a question please? if menhaden are the big deal in the atlantic, what is the equivalent in the pacific? mullet? There is a Pacific Menhaden in South America, but the Pacific also has huge schools of anchovies as well.